There is little doubt that the word legend is frequently overused in football but when it comes to Chester City Football Club there is one man who fully deserves the accolade and that is Harry McNally. A real character both on and off the field, Harry was passionate about football and his knowledge of the game was second to none. The sight of Harry parading the touchline in his long blue coat, barking out orders and ranting and raving at all and sundry was a real sight to behold and football will be all the poorer for his passing. Harry was one of a rare breed of managers who never played league football and most of his playing career was spent at Skelmersdale United where he also did some coaching. He was a surprise choice of manager at Chester in the summer of 1985 following stints at Altrincham, Southport and Wigan Athletic and was one of the longest serving managers in the league when he left in 1992. After leaving City he scouted for a number of clubs including Stockport, Preston, Tranmere and Blackpool. Harry’s uncanny knack of picking up bargains from non-league football served Chester well in his seven years as manager and players like Graham Abel, Carl Dale and Barry Butler all owe their Football League careers to the man. He was also responsible for signing heroes such as Milton Graham, Roger Preece and his general on the field of play, Graham Barrow who all served the club with distinction. You could always rely on a Harry side to give 100% effort and during his time in charge the team were rarely beaten by more than a single goal. He wouldn’t tolerate a lack of effort and for Harry, running through a brick wall for the cause was not enough. He expected players to run through the wall, rebuild it and then run through it a second time. For many people Harry will be remembered for his tremendous feat of keeping Chester in Division Three in the Macclesfield years but it should not be forgotten that he also took the club to promotion in 1985/86 and 8th in Division Three in 1988/89. The promotion side in particular, spearheaded by the early season goals of Stuart Rimmer, played some tremendous football and the 6-3 victory at Preston and 4-0 hammerings of Crewe and Burnley will long be remembered. However, it was the backs to the wall performances from 1990 to 1992 that will live longest in the memory as City competed on equal terms with clubs like Birmingham City, West Bromwich Albion and Stoke City on gates that often sank to less than 1000. It may not have always been pretty to watch but the results were all important and the achievement of maintaining Chester’s Division Three status against all the odds should never be under-estimated. Perhaps the best example of a Harry performance was his very own World Cup Final, at Stoke’s old Victoria Ground, at the end of the 1991/92 season. With Stoke chasing promotion and the Blues staring into the abyss of relegation Harry’s Chester packed the midfield, smothered the Potteries side and snatched an improbable victory courtesy of a late Gary Bennett goal. This result was one of the reasons why the Sun newspaper made him their Manager of the Year in 1992. A frequent visitor to the ground in recent years Harry will be greatly missed and our condolences go out to his family and friends. 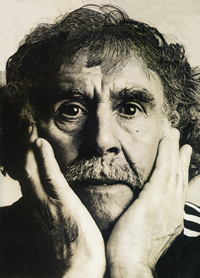 There was only one Harry McNally. • A report and pictures from Harry’s funeral and wake can be read here.